Senior Dmytro Mamedov snapped a three game losing streak. 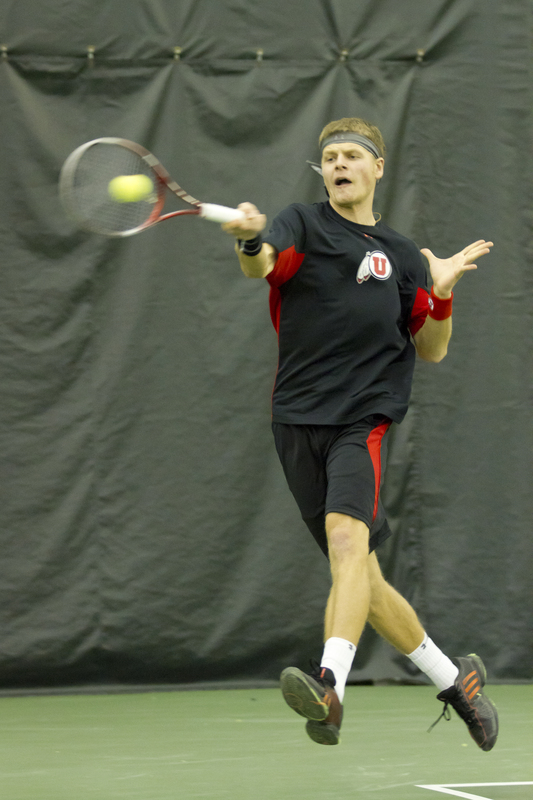 For the second time this season, the University of Utah men’s tennis team (11-6, 1-0 Pac-12) earned themselves a victory over a ranked team. The Utes upset No. 42 ranked University of Oregon (13-3, 0-1 Pac-12) on Friday in Salt Lake City, Utah, 5-2. The Utes started the day off slow losing the doubles point, but, for the 8th time this year, found a way to win in singles. Senior Dmytro Mamedov tied the score for the Utes with a 6-1, 6-3 victory from the No. 1 singles position. Cedric Willems and Ben Tasevac quickly followed with wins from No. 5 and No. 6 singles, putting the Utes up 3-1. Junior captain Alejandro Medinilla then sealed the deal with a 6-4, 6-3 victory from the No. 3 singles position. With the win, Utah improves to 8-1 at home this season. The Utes are back in action on Easter Sunday when they face No. 29 ranked University of Washington (13-6) at 2pm in Salt Lake. Weather permitting, the match will be played at Liberty Park. #2. Slim Hamza (UU) def. Jeff Mullen (ORE) 6-4, 6-7(5), 3-1 ret. This entry was posted in Schedule/Results and tagged Alejandro Medinilla, Ben Tasevac, Cedric Willems, college tennis, Devin Lane, Dmytro Mamedov, ITA, Pac-12, Slim Hamza, University of Utah, Utah Utes. Bookmark the permalink.